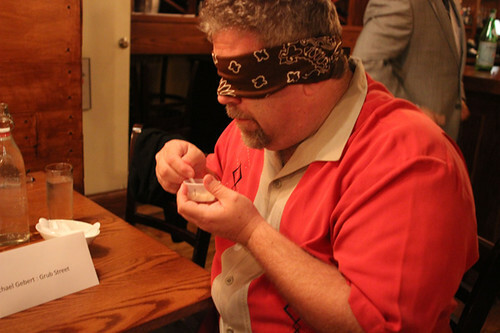 Me in full Guy Fieri mode at a fundraiser for Share Our Strength, in which local food writers were challenged to identify ingredients blindfolded. One year ago tomorrow I took over Grub Street Chicago. Actually, I started posting two weeks before that, but at that point I was filling in after Nick Kindelsperger’s departure (mainly because I had just done the same several weeks earlier when he went on vacation). It took two more weeks for me to officially become the guy. In the end I decided that writing for Grub Street offered the most important thing any job can— the opportunity to make my own opportunities out of it. So sure, I cover the sceney-scene, and some of it means covering total BS places, but it also means that when a glitzy place like Nellcôte comes along, I can focus on the side of it that’s more real and chef-geeky and interesting to me, and not just whether or not it’s hot enough to draw a Landan twin. In the end, I think that given a choice between seizing an opportunity to see what you can make of it and shying away from it, you should usually do the former and see where it goes. So I did, and have had many reasons to be glad I did. Any gig where covering Charlie Trotter merely proves to be the stepping stone to getting an inside look at a barbecue competition (they have the same publicist, as unlikely as that may seem) is offering something way more diverse than just the chance to eat on the cuff at fancy hotels. • Interview with Andrew Zimmerman (I’ve done several interviews I’m proud of, but this one probably has more solid, no-BS commentary on being a chef and training young people than any of them). Part one; part two. • Is This The Worst New York Times Piece on Chicago’s Scene Ever? 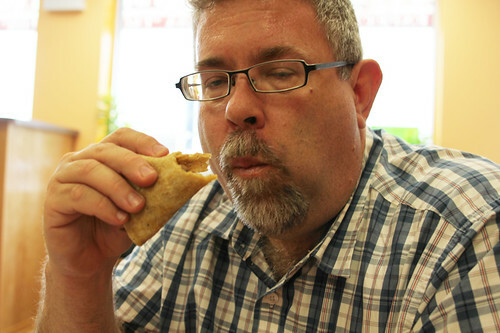 Scouting tacos for the taco slideshow. Photo credit: Liam Gebert. Bravo! A job well done. Looking forward to the next year. you really have done a fantastic job and, as you noted, embraced the opportunity to take full advantage of the position and platform. you have a distinct voice and vantage that I always find refreshing. your work often goes well beyond the expectations (at least mine) for a local version of a national food website/blog. congratulations on a great first year, and keep it up. I actually thought you’d been there longer than a year, and I don’t mean that in the sense of “god, this is going on a long time?” of course, but rather you’ve put out so much valuable content and good stuff, that it seems as though you’d been working on it for longer than you actually have. Not sure that made sense. Anyway, well done, my friend, yours is one of the few sites I visit several times a day. A big ups to you mon! Between the taco slideshow (which had me eating tacos for two weeks straight) and all the great videos you’ve produced I just cant get enough. Congrats and cheers to many, many more.